Photographing the northern lights is an incredibly rewarding activity, though a little knowledge goes a long way in capturing the dancing wonders. Autumn and Winter are the best times for viewing the aurora, while March and October are regarded as the two months with the most impressive light shows. However, visibility fluctuates on a daily basis relative to periods of high pressure, which increase your chances of catching the lights, as well as with changes in geomagnetic activity, which spikes during the solar storms that produce the brightest auroras. For this reason, it’s a good idea to consult aurora forecasting resources like the NASA-run Space Weather Bureau, The University of Alaska, or, for European locales, The Aurora Service. Photos of the aurora taken at dusk or late in the day give you the chance to set the lights against a background palette of beautiful sky colors or foreground landmarks. However, in general, the aurora is most active and photos will be clearest at times when the sky is darkest, from late night to early morning (approximately 9:00pm to 4:00am). The lights often evolve through a variety of stages over the course of the night, so set up early and come well-rested if you want to take advantage of the full range of photo opportunities! The lights are visible for much of the year in the latitudinal band known as the auroral zone, which corresponds roughly to the Arctic Circle. The closer you are to these Northern latitudes – about 68 to 74 degrees – the better your odds are for catching the light show, but latitudes above 55 degrees offer plenty of good opportunities as well. During periods of higher geomagnetic activity the aurora expands towards the equator, when it can be seen at much lower latitudes. Once you’ve checked to make sure that the sun storms are raging, what’s the ideal photographic nest for snapping the borealis? First of all, unless you want to include terrestrial foreground elements (trees, buildings, cityscapes or skylines, mountains and so forth) in your photos of the aurora, it’s best to get as far away from the light pollution of towns and cities as possible. The darker the sky, the clearer and brighter your photos will turn out. This means that it’s ideal to synchronize your aurora expedition with a new moon unless you specifically want the moon in your shots, or a foreground landscape illuminated by moonlight. Find a spot with an unobstructed view to the north, where the aurora will be brightest. 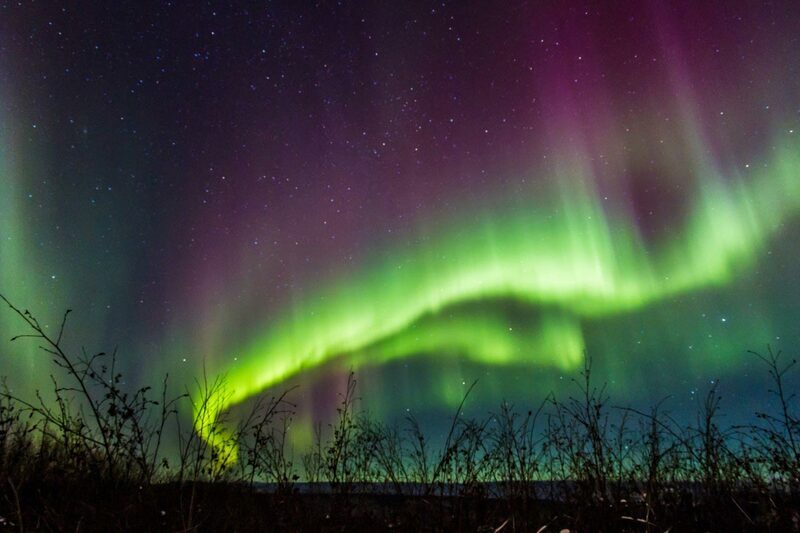 The full spectrum of the lights often expands well in the lower sky, so a clear, flat horizon is ideal so that you can see as much of the aurora as possible. The long exposure times necessary for taking good shots of the aurora mean that a digital SLR will do a much better job than a point and shoot camera. The perfect DSLR for the job is capable of manual focus, long exposures with relatively low noise, high ISO, and has a RAW mode. A full frame sensor and a wide-angle or prime lens are preferable since you’ll likely want to get as much of the sky as possible into your photos; with a full-frame sensor, a 20-35mm lens will get the job done, while smaller sensor require shorter lenses, around 10-25mm. No zoom or autofocus is necessary. The perfect lens will be sharp and fast, with an ideal maximum aperture of f/2.8 or lower (the lower the f-stop number, the larger the aperture) to keep exposure times reasonable. Don’t forget to remove any lens filters before capturing the aurora to avoid rings in your photos caused by spectral emissions. Since you’ll need long exposure times to capture the Northern Lights at the brightest, it’s important to stabilize the camera. For this, you’re going to need a tall, sturdy tripod to mount your camera. A wireless remote or cable release helps avoid the motion caused by pressing buttons on the camera’s body, although at temperatures below 0 cables may freeze or break. An alternative solution is to set the camera’s trigger delay timer to a second or more after the button is pushed so that the shutter won’t open until the camera is still. A lens shade helps prevent flare and keeps frost and condensation off of your lens. Headlamps are useful for adjusting settings on the camera while keeping your hands free. You’ll want to bring multiple batteries and memory cards so that you’ll be prepared for whatever challenges or opportunities come up: remember that cold temperatures will make your batteries drain more quickly, and the last thing you want is to run out of battery just as you perfect your set-up. Keeping them somewhere warm like a pocket or lined bag will help preserve their charge. A 2-gallon Ziploc bag is a great asset for getting condensation out of your camera when you bring it inside. Put your camera in the bag and zip it up when you come in fromout of the cold, and much of the moisture will evaporate out of the camera body onto the inside of the bag. Photographers of the Northern Lights have to perform a balancing act between the long exposure times necessary in order to capture the low light levels of the aurora and the need to limit exposure times to avoid blur or distortion from the aurora’s movement. The most effective solution is shooting at the highest ISO that produces photographs of acceptable quality, which will typically range from around 400 all the way to 3200, depending on your camera. This value can be calibrated by starting low and reviewing the results as you increase the ISO, as higher ISO’s produce grainier images. If your camera has a High ISO Noise Reduction or Long Exposure Noise Reduction setting, turn it on (the latter isn’t necessary if shooting RAW). The higher the ISO, the shorter the shutter time necessary; likewise, the lower the f-stop, the shorter the shutter time will need to be. Thus, a camera with f/2.8 shooting at 400 ISO may require a 30 second shutter speed, whereas at 1600 ISO, closer to 5 seconds is necessary. Once again, the perfect exposure time can only by calibrated through trial and error, starting at shorter durations and adding additional time if the results are too dim or unimpressive, although, as a general rule, it’s rare to get good shots with a shutter speed below 4 seconds. The f-stop should be set to the widest aperture possible, while focus should be set to infinity. If, as with some newer lenses, the infinity setting seems to focus beyond the aurora, you may need to manually set the focus to a distant point on the horizon. Finally, shooting in the RAW format takes a great deal of memory card space, but also affords you the maximum opportunity for editing and refinement after your Northern Lights shoot is complete. Clothes are last but not least on the list! You are likely to be standing still in extreme cold for a long time, so it’s necessary to plan ahead for your own comfort. High-quality, comfortable boots with wool socks or insoles and enough heel to insulate you from the cold ground are the first consideration, since you may be on your feet for hours waiting for the perfect shot. Since you’ll be standing still, it’s important to have heavy layers rather than many layers since the cold-fighting advantages of layering are associated with physical activity. This means you’re going to need a very warm, thick jacket as your outer layer. Finally, lest all your preparation be in vain due to frozen, fumbling fingers at the crucial moment, you’ll want to bring heavy, lined gloves and hand-warming packets to keep your fingers and hands ready to snap the perfect photos of the Northern Lights!